The official  opening of the new R&D center welcomed distinguished guests from  politics and industry. 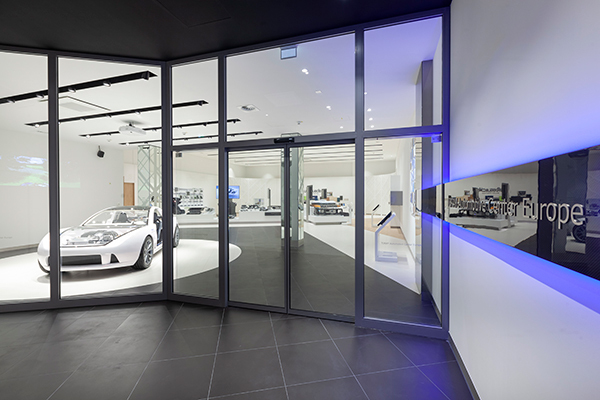 The AMCEU showroom displays Toray's wide range of products in the automotive sector. Tokyo/Munich, February 1, 2019 – Japanese materials technology specialist Toray Industries, Inc.  hosted the opening ceremony of its Automotive Center Europe (AMCEU) in Neufahrn near Munich on 25 January, 2019. This new research and development center is dedicated to addressing the material-technology  challenges facing the automotive industry. To this end, the AMCEU is working closely with vehicle manufacturers and suppliers. In addition to national and international company representatives, other prominent  guests at the event included the Japanese ambassador for Germany and the head of the Department of Energy Policy and Energy Infrastructure at the Bavarian Ministry of Economic Affairs. The automotive industry is changing. New technologies offer many new opportunities, but also pose new demands on materials and vehicle design. Toray is convinced that the further evolution of the vehicle depends on using the right materials. The company has made it its mission to provide its customers with integrated material solutions that address  the central challenges of the future. These include lightweight construction, electrification, and higher standards for safety and comfort. To make this possible, the AMCEU works closely with OEMs and suppliers right from the vehicle design stage, and brings together the expertise of Toray's subsidiaries throughout Europe. The AMCEU is also in close contact with Toray’s  Automotive Center in Nagoya (Japan), which opened in 2008. In this way, the R&D center near Munich aims to become an innovation hub for the European market. In addition to development labs, the AMCEU includes test facilities and a large showroom. Here, Toray will display the full spectrum of its material solutions,  from textiles and decorative elements for interiors to battery separator films, CFRP components and crash pads made of resins. The highlight of the showroom is Toray's TEEWAVE AC3 concept car, which is made almost exclusively from Toray materials. By actively participating in the development of the automotive industry, Toray wants to contribute to more sustainable  mobility in the future. As part of its "Green Innovation" initiative, Toray is, for instance, promoting new materials for alternative power trains and  helping  reduce emissions with materials that reduce the weight of vehicles. In the long run, Toray's R&D activities around the world aim to contribute to a bright and healthy future for all. Toray Industries, Inc. is a leading global manufacturer of high-performance materials headquartered in Tokyo. The company was founded in 1926 and has been led by Akihiro Nikkaku since 2010. Toray employs approximately 47,000 people in 27 countries worldwide (as of August 2018). The company's product portfolio includes the manufacture and processing of textiles, fibers, plastics and a wide range of performance chemicals. Toray Industries is also the world's largest manufacturer of PAN-based carbon fibers. In Europe, the group is represented by Toray Industries Europe GmbH based in Neu-Isenburg.